The Blue Whale is the largest animal ever to have lived on earth. Their tongues alone can weigh as much as an elephant - their hearts, as much as a car. The Blue Whale is the largest animal ever to have lived on earth. Despite being so massive, this giant of the ocean feeds on some of the smallest marine life – tiny shrimp like animals called krill. 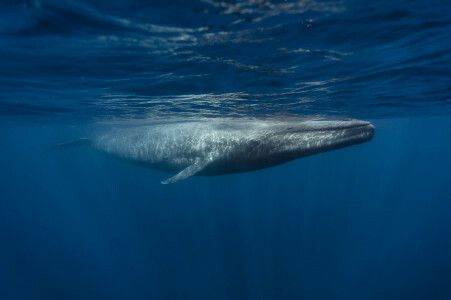 A single adult blue whale can consume 36,000 kg of krill a day. Incredibly, Blue Whales are graceful swimmers cruise the ocean at over 8km/h, and can reach speeds of over 30km/h. They mainly catch their food by diving, and descend to depths of approximately 500 m.
The whale’s mouth has a fascinating row of plates fringed with bristles to help it filter its main source of food – plankton from the water. There is what looks like a moustache of long bristles on the end of each plate to help it hold the minute prey. With each mouthful, the whale can hold up to 5,000 kg of water and plankton. Having forced the water out of its mouth, the whale licks these bristles with its fleshy tongue. Although the blue whale is a deep-water hunter, as a mammal, it must come to the surface of the sea to breathe. When it surfaces, it exhales air out of a blowhole in a cloud of pressurized vapour that rises vertically above the water for up to 9m. Females breed only once every three years and gestation is between 11-12months. Females usually only have one young. A baby blue whale (calf) emerges weighing up to 2,7000kg and up to 8m long. New born whales are helped to the surface of the water by their mothers and are often encouraged (nudged) by other females so that they can take their first breath of air. The calf is suckled in the water, drinking more than 600 litres of milk each day and gaining about 90kg every day for its first year. Blue whales occasionally swim in small groups but usually swim alone or in pairs. They are thought to form close attachments. It is thought that whales feel emotions. For example, this incredible story of how a Humpback Whale showed affection and thanks when it was saved by divers. Intensive hunting in the 1900s by whalers seeking whale oil drove them to the brink of extinction. Hundreds of thousands of whales were killed. The 1966 International Whaling Commission finally gave Blue Whales protection, although they have only recovered slightly since then. Blue whales are currently classified as endangered on the World Conservation Union (IUCN) Red List. It is estimated that only 10,000-25,000 blue whales now swim the world’s oceans. Life Span: Average 80-90 years. Known to have lived 110 years. Habitat: Oceans. Often spend summers feeding in polar waters and undertake long migrations towards the Equator as winter arrives. Range: All the world's oceans.